Today I am wearing some of my new Zoya polishes. These are from their new Satins Collection. The blue is Neve and the teal is Giovanna. 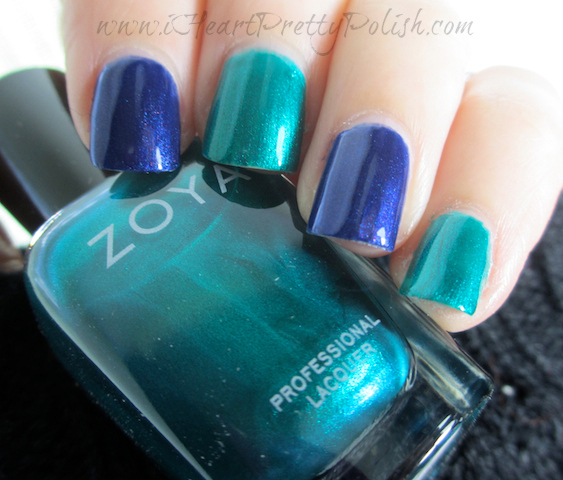 Zoya describes Giovanna as an "emerald green metallic". This manicure features two coats of Giovanna. I noticed that the formula was a little thin and watery. To make it manageable, you have to really clean the excess polish off of the brush before applying it to your nail. Zoya describes Neve as a "sapphire blue metallic". Neve is very opaque in one coat. I added two out of habit, but you can totally get away with one. Neve was a bit watery too, but nothing I couldn't work with. My favorite of the two is definitely Neve. The color is so rich and dimensional. I think Giovanna is a little flat for a metallic. I am not that big of a fan of metallic teal polishes, so I may just be hard to please when it comes to that shade/finish. 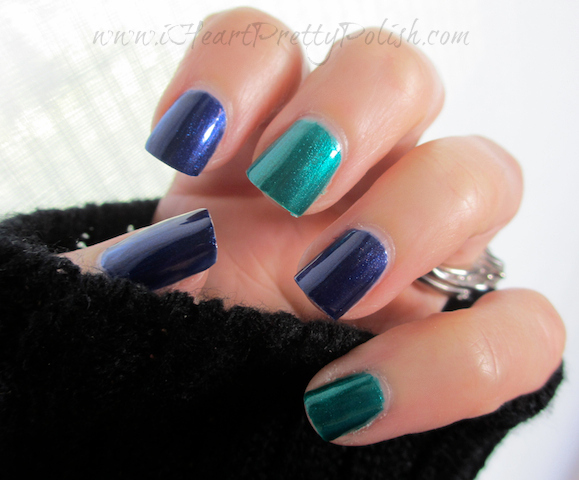 Both of these colors are available on the Zoya website for $8.00. I'm sure they will also start appearing at Ulta within the next few weeks (perhaps they are already there). If you haven't tried Zoya and would like to, feel free to click my referral link at the bottom of my site. If you use my link, you will receive a free bottle of nail polish. If you add two polishes to your order, you will get free shipping. Zoya is such a great brand and I highly recommend it. Note: Zoya Neve & Giovanna were provided to me for my honest review. See my Disclosure Policy for more information. I love your color combos!! Lovely pictures! :) Giovanna looks too teal to me to be called emerald, but what do I know? :D I still really like it and Neve. How far off from Song is Neve? I agree, it's not quite emerald. I'll compare Neve and Song for you soon. Omigosh I NEED Neve, stat! They both look gorgeous together like that. Yes, I thought they worked well together:) Thanks for your comment! I'm glad you like it:) Have a great day. Giovanna is my favorite! I think it's funny how a lot of us are worried about how others will react to our blogging. I know I am, but most people support it. I agree, Neve seems to have so much more dimension to it. The multi colored shimmer makes all the difference! I reallllyyy like these two polishes together, the colors just play off each other really well! However I think giovanna is my favorite! :) Thanks for taking the time to comment. I like them together too :) Kindof nautical. I'm glad you aren't hiding it from your friends anymore - be proud, and you should be - lovely swatches as always! These are pretty! Last year people at work saw me taking pictures of my nails and asked me what I was doing - I told them I had a nail polish blog and they looked at me like I was nuts. But then I noticed they kept looking at my nails to see what I had on. LOL, I hope no one at work finds out! Neve is my favorite of these too! It is so gorgeous! I know, I can't wait to wear it again. Thanks Christine! And thanks for stopping by!